In Lesson 8, we have understood the concept of data and learned how Visual Basic 2015 classifies various data types. Now, we shall learn how to store the data and how to declare them. 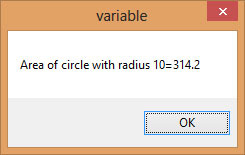 Visual Basic 2015 data can be stored as variables or as constants. Variables are like mailboxes in the post office. The content of the variable changes every now and then, just like the mailboxes. In actual fact, variables are the specific areas allocated by the computer memory to store data. Notice that you can assign a value to the string in one line using the = sign instead of declaring the variable and then give it a value in another line. 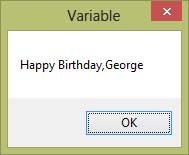 When you run the program, a message box that shows the text "Happy Birthday, George" will appear in a message box, as shown in Figure 9.1. The above keywords indicate the scope of the declaration. First of all, the keyword Private declares a local variable or a variable that is local to a procedure or module. However, the Private keyword is rarely used, we usually use the Dim keyword to declare a local variable. On the other hand, the Static keyword declares a variable that is being used multiple times, even after a procedure has been terminated. Moreover, most variables created inside a procedure are discarded by Visual Basic when the procedure is terminated. However, the Static keyword preserves the value of a variable even after the procedure is terminated. 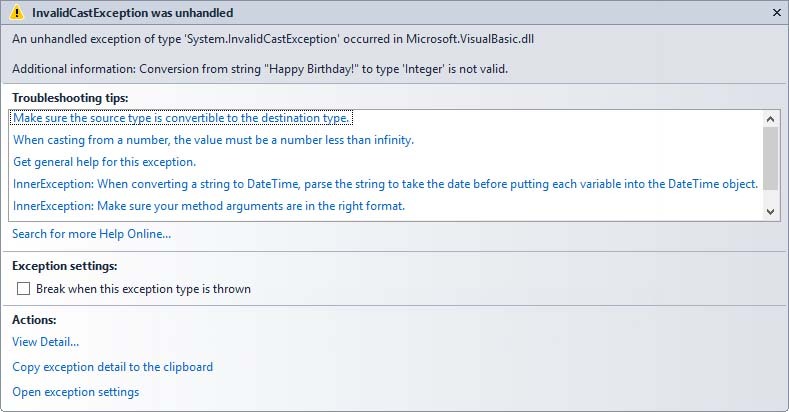 Lastly, the Public keyword declares a global variable, which means it can be used by all the procedures and modules of the whole Visual Basic 2015 program.